Why does your restaurant need a promotion engine in an online food ordering system? Certainly, you offer various promotions to customers of your restaurant. If you are also selling food online, it is important that your online food ordering system enables you to also configure such promotions. Otherwise, you will lose the biggest advantage of online ordering, namely, increasing the number of orders and saving time. Your customers will prefer placing orders by telephone to benefit from your promotions. Your employees will have to spend more time on answering phones and taking orders. Additionally, customers are not too happy when promotions do not apply to an online food ordering system. They want to order online! It’s simple and quick. Failure to offer promotions in this channel may be considered unfair by customers. Hence, they will choose a restaurant that offers such promotions. 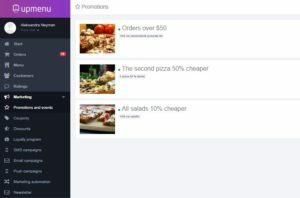 What is a promotion engine in an online food ordering system? A promotion engine enables you to configure special offers in the online food ordering system. The more advanced the system, the more complex the promotions you can create. How do promotions work in the UpMenu system? Creating promotions in the UpMenu system is very simple. You specify the promotion conditions and decide whether it is to be offered as a voucher or whether the special offer is to be applied automatically when the customer places the order. You can also use it as a permanent discount applied to a specific customer. There are many options. If you wish to increase sales of either particular products or entire product groups, they can be covered by a promotion. Offer a discount for single items in the menu or entire product groups. The choice is yours! Setting a promotion for additional products is a great idea for increasing the value of your customer cart orders. As a result, they will simply order more. In this case, the mechanism works similarly as for promotions for the second product. Setting a promotion for orders exceeding a specific amount will make your customers order more! Additionally, the UpMenu system enables you to combine such promotions in any way you wish! For instance, you can set a promotion for the second product but only if someone is ordering two pizzas. Benefits of having a promotion engine in an online food ordering system? Every promotion has one key goal – to increase sales. With the online food ordering system, you can increase your profits. What are the other benefits of configuring promotions in an online food ordering system? Your customers will be happier to order online – promotions offered with orders made on a website and through the restaurant mobile app will attract them and show them that you are aware of their needs. You will increase the loyalty of your customers – loyal customers place more orders and you will earn more. Save your time and the time of your employees – the promotion engine in the UpMenu system enables you to set a particular promotion quickly. Your telephone line will be less busy and your employees will no longer have to explain why a given promotion does not apply to online orders, which can now easily be collected through the online food ordering system. Remember that doing too many promotions may not be the best idea. Your clients can then buy at normal prices and become “promotionists”. In this case, your profits will not increase. The UpMenu system will help you utilise all the benefits that a good promotion engine offers in a quick and easy way. Find out more about all the other marketing features you will obtain along with the online food ordering system – read the following article The top 6 online food ordering features for your restaurant. Contact us! We will be more than happy to help you launch online orders and increase your sales with a promotion engine!